Springtime is finally here! And with it, beautiful, warm weather, perfect for an afternoon spent on your brand new deck. That’s right — if you’re like the overwhelming majority of families in the US, you’re currently thinking about treating, upgrading or enhancing your existing deck or building a new one from scratch. To do that, you’ll need lumber, which brings us to the big question: wood or composite? Whether you opt for a porch or a deck, when it comes to building your ideal outdoor living space in Durham, NC, there are three major factors to consider of your chosen lumber option: initial cost, maintenance and treatments. Here at Gerald Jones Company, we’ve broken down the discussion of wood vs. composite decking into those three categories, providing the pros and cons for each. Wood: Offering a lower comparative price, wood decking requires a smaller initial investment than composite decking boards, but it will require additional expenses for treatments and maintenance down the road. 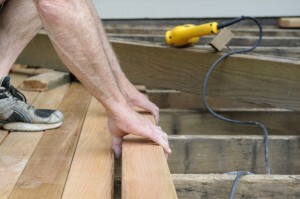 Prices for wood decking will vary according to the specific type of lumber. Some of the more common wood decking options are redwood, cedar and pressure-treated lumber. Composite: Often made from PVC or a combination of wood fibers and polymers, composite decking provides a range of color options that won’t fade over time. Given its hardiness, composite decking has a higher initial cost than regular wood decking, but the lack of required maintenance more than makes up for that difference. Wood: Protecting your investment requires a fair amount of upkeep. To prevent discoloration and wear from the elements, you’ll need to regularly maintain your wood deck, investing in wood treatments. Composite: No maintenance is required. By investing in composite decking boards with new capped board technology, you won’t have to worry about fading colors or stains, either. Wood: If you’d like to get any decent amount of use out of your wood deck, then it’s critical that you buy treated lumber and subject it to regular staining and sealing. There are a variety of treatment options available for wood deck boards, including pressure and chemical treatments, as well as water protection. Buying wood with water repellant added during the treatment process will reduce shrinking in winter and swelling in summer, which decreases the likelihood of the wood splitting or cracking. Composite: You can purchase composite decking in a number of different colors made to give the deck boards and railings the look of imported hardwood. Composite decking requires no additional finishing, sealing or staining and has the option of grooved edges for hidden fastener attachments, which give the final product an even cleaner appearance. Whether you’ve decided on wood or composite decking or still have questions, give our Durham, NC deck building professionals a call today at (919) 286-1700. Family owned and operated for over 60 years, Gerald Jones Company is happy to help with all of your Durham home improvement and custom building needs, including vinyl siding and personalized deck additions. This entry was written by geraldjones, posted on April 6, 2015 at 7:38 am, filed under Uncategorized. Bookmark the permalink. Follow any comments here with the RSS feed for this post. Both comments and trackbacks are currently closed.